U.S. Residential Furnace Market size is set to surpass USD 200 billion by 2025; according to a new research report by Global Market Insights, Inc. Growing demand for high temperature heating products in the region owing to extremely low or high temperatures is likely to promote demand for residential furnace in forecast timeframe. These products are widely accepted in households due to their usage in summer & winters. Its features of providing warmth and constant air circulations in order to increase comfortability may fuel residential furnace market size in U.S. These system function through blowing air through ducts which distributes warm air to rooms via grills or registers. These products can be operated with electricity, wood, gas and oil which gives it a variety of feed stock to function, thereby stimulating U.S. residential furnace market size. Features including temperature control, high efficiency, low running cost are likely to drive industry growth by 2025. 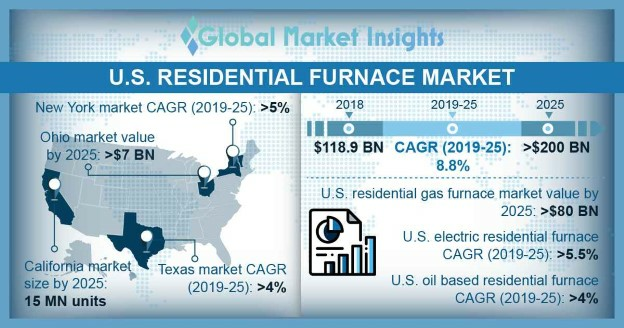 Growing central furnaces installation activities owing to rising number of old furnace system along with availability of new and advanced technologies may stimulate residential furnace market size in U.S.
Ohio residential furnace market size may witness surpass USD 7 billion at the end of 2025. Electric and oil furnaces are usually used in these regions, however, gas based are widely used heating system due to their efficient and cost effective operations. Stringent government regulations regarding energy consumption and saving is likely to promote manufacturer to focus on producing heating equipment with high AFUE, which may propel household furnace demand by 2025. U.S. oil based residential furnace market size may witness gains of over 4 % up to 2025. It is widely used in big housing buildings which requires large system in order to cover large area. These products distribute warm air through vents, hot water via baseboards and steam by radiators. Furnace systems pulls oil from tank and sends it to burner in order to get ignited in the combustion chamber, thereby offering high output and increased efficiency. Increasing electric based systems energy consumption along with high installation cost may affect residential furnace market in U.S price trends. Rising repairing cost of the product in order to make energy efficient systems may impact industry profitability. U.S. residential wood furnace market size may exceed USD 15 billion by 2025. These products are used in extreme cold places in order to provide heat & warmness in housing buildings. However, recent amendments including phase 2, EPA regulations, which will require furnace producers to decrease emissions by more than 84% is likely to affect product demand in forecast timeframe. Texas hybrid residential furnace market size may observe significant gains of over 4% in anticipated timeline. Electric, gas, fuel and wood based system can be combined together in order to form a hybrid furnace. These products offer high efficiency and consistency obtained by combing properties of different systems will drive industry growth. Residential furnace market share in U.S is moderately fragmented among player including, York, Carrier, Lennox, Bryant, Rheem, Daikin, Luxaire, Rudd, Amana and Boyer Town Furnace. Producers are emphasizing on lowering the running cost and increasing furnace efficiency by combing different throughput including oil, gas, electric and wood. Manufacturers are also focusing on new product launches and revamping activities in order to cater product demand.